• Smith and his staff got word Thursday that the NCAA has granted a sixth year of eligibility to quarterback Jake Luton. The 6-7, 235-pound Luton has started nine games over the past two injury-plagued seasons, completing 223 of 359 passes (62.1 percent) for 2,513 yards and 14 touchdowns. "It's big to get Jake back," Smith says. "He has a year of experience in our offense, plus some game experience the year before. I'm optimistic he'll help our offense be better next year." Luton will enter spring practice No. 1 on the depth chart at QB. "He's first up," Smith says. "We have some other guys to add competition to it. I describe all of spring ball as a seating chart. Every position will go through some competition." Luton's prime competition will come from Tristan Gebbia, the 6-2, 195-pound sophomore transfer from Nebraska. Gebbia enrolled in school in the fall and was able to practice with the Beavers, sharing scout-team duties with Nick Moore. Gebbia and Moore also served at QB during Sunday scrimmage sessions with the OSU young players who had seen little or no action in games the previous day. "We feel good about Tristan," Smith says. "You can see his natural leadership skills. He's an accurate thrower, and he loves to practice." Moore, a 6-0, 190-pound sophomore, is younger brother of ex-OSU great Matt Moore. After a transfer from Eastern Washington, where he redshirted as a true freshman in 2017, he also enrolled at OSU for fall term. "Nick throws the ball well, too, and he's as competitive as heck," Smith says. "He'll be in the mix." Also returning at QB are junior Jack Colletto, who started one game last season and served as a "wildcat" specialist, rushing for five touchdowns, and sophomore Aidan Willard. • Smith and his assistant coaches hit the road Friday to begin a three-week recruiting period before college football's second signing date on Feb. 6. The Beavers signed 19 players in December, including four transfers from Nebraska and Oklahoma, and are looking to add "three or four players at the most," Smith says. Ideally, that would mean adding one player to the offensive and defensive lines. "But we're not going to say no to a really good player at any position," he says. • Smith has awarded one scholarship to a walk-on from last season — senior receiver/special teams player Andre Bodden. Bodden caught two passes for 37 yards, made four special-teams tackles and blocked a punt against Washington. Other than quarterback Conor Blount — who announced he would transfer shortly after last season — Smith believes all the scholarship players with eligibility are returning for next season. • All four of the aforementioned transfers — Gebbia, receiver Tyjon Lindsey and linebacker Avery Roberts of Nebraska and linebacker Addison Gumbs of Oklahoma — will challenge for starting jobs, Smith says. All were enrolled in school for fall term, and three of them practiced with the Beavers. Gumbs, who was rehabbing from an ACL knee injury, did not. The 6-3, 230-pound Gumbs, incidentally, might be hard to beat out at outside 'backer. "He was running with the 'ones' at Oklahoma when he sustained the injury" a day before the Sooners' opener last season, Smith says. "We're counting on him to help us a lot." • Ten of the 15 JC and high school players who signed in December are enrolled in school for winter term and will participate in spring ball. That's surely a record at Oregon State. "It's a benefit for them and for us," Smith says. "They get to start with school early, and we get them for a whole winter of workouts. It wasn't a deal-breaker, though. We're excited about the kids who are coming in June, too." 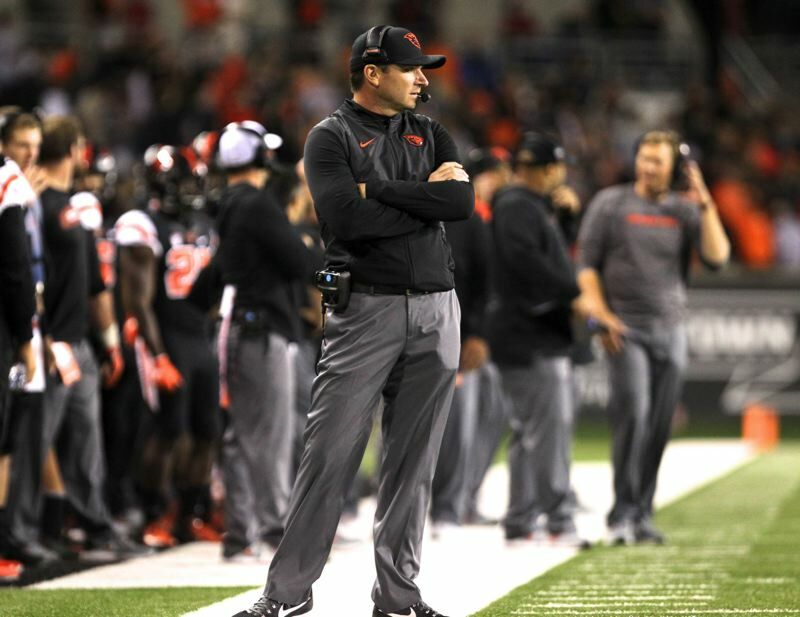 • OSU coaches focused on recruiting offensive and defensive linemen. They got plenty of both. "I feel good about what we got across the board," Smith says. On the offensive side, the Beavers have added 6-3, 290-pound center Nate Eldridge, a graduate transfer from Arizona, and 6-5, 270-pound JC transfer Rob Vanderlaan and 6-4, 285-pound grayshirt Joshua Gray, both tackles. Eldridge is finishing his academic requirement at Arizona and won't arrive until summer. Vanderlaan, who has three years to play, is on campus now. Gray arrived in the fall and was around the program, though he didn't practice. He took a partial load of classes to maintain his grayshirt status. On the defensive side, OSU picked up five linemen — JC players Jordan Whittley (tackle) and Simon Sandberg (end) and high school players Evan Bennett (tackle) and ends Cory Stover and Kelsen Hennessy. The 6-3, 320-pound Whittley is listed as a senior, "but we think he'll have two years to play for us," Smith says. Whittley will compete for a starting job. "Jordan is athletic for his size, and physical," Smith says. "When he gets in a D-I strength program, we'll add to that." The 6-3, 265-pound Sandberg, a Swedish native who didn't play last season at City College of San Francisco due to injury, has "at least two years to play, with the possibility of three," Smith says. "His upside is really high because he hasn't been around the game very long." The 6-3, 315-pound Bennett, who played for the nation's No. 1-ranked high school team — Mater Dei in Santa Ana, California — "has the physical tools to play right away for us," Smith says. The Beavers will get another lineman when Sherwood High graduate Josh Bowcutt, who was 6-5 and 280 as a senior, returns from a two-year church mission in June. "He's a good-sized kid who could play either side of the ball," Smith says. "Right now, we have him on offense. After being gone two years, though, you never know what these kids look like in terms of body when they get back." • Oregon State was solid and at times excellent on offense a year ago. The Beavers were one of the nation's worst defensive teams, however. Smith says that will change, in part due to the recruiting talent being added, in part due to the maturation of returning players, and in part due to the return of a few injured players. The Beavers return their top nine tacklers from a year ago and will have reinforcement available next season. Junior cornerback Jay Irvine and sophomore safety David Morris, who missed last season, are projected starters, and junior Omar Hicks-Onu is expected to compete for a role in the rotation at safety. The Beavers return nearly all of their players at linebacker and in the secondary. Seniors Shemar Smith and Andrzej Hughes-Murray, juniors Kee Whetzel, Hamilcar Rashed and Doug Taumoelau and sophomores Matthew Tago, John McCartan and Isaiah Tufaga all got ample playing time at linebacker. Add Roberts and Gumbs into the equation and it should be a much stronger position than in 2018. Returning cornerbacks include Irvine, senior Shawn Wilson, junior Isaiah Dunn and sophomores Kaleb Hayes, Jaydon Grant and Jaden Robinson. Among safeties coming back are Morris, Hicks-Onu, senior Jalen Moore and sophomores Jeffrey Manning, TraJon Cotton and Moku Watson. "All of these guys have game experience and a year's experience in our program," Smith says. "We were really young on the defensive side last year. That won't be the case next year. "We have to play better defense. We all know this. Our guys will develop, and they'll be better on that side of the ball." • Smith believes the work of strength and conditioning coach Mike McDonald will pay dividends in a couple of areas. McDonald — who has worked with Smith for seven years (two at Boise State, four at Washington, one at OSU) — has done an excellent job at positioning the players for injury prevention, Smith says. "We're so much better off in terms of long-term injuries," the coach says. "When we got here last year, we had a dozen guys coming of surgery. Right now, we have one player (sophomore running back Calvin Tyler, recovering from ACL surgery) scheduled to miss spring ball because of long-term injury. "Mike is going to have our players in better shape than they've ever been. He pushes the kids and is pretty demanding, but they love him. They love his discipline and his work ethic. It's not just about getting big and strong, though we're doing that. He's an expert when it comes to creating explosiveness." • Smith is busting his buttons over a record achieved on another front. "These guys are crushing it academically," he says. The OSU players averaged a 3.2 grade-point average for fall term, Smith says. "Before we got here, (an OSU football team) had never averaged 3.0 or better for a term," he says. "We did it (a 3.0) last term and have continued that and upped it to 3.2 in the fall. I'm really proud of that. "We're establishing some things that don't show up right away in wins and losses. But we need to get some things established in terms of culture before we can take off like we want to." • Smith hasn't made a hire for the secondary coaching position vacated when Greg Burns left for Southern Cal. Smith says he is continuing the search — "I've talked to at least a half-dozen (candidates)" — but is "not that close" to a hire. "It's been interesting," Smith says with a laugh. "The more time you take, the more candidates pop up." • Spring practice will be split into segments of two and three weeks. The first segment will include six practices beginning March 5. After finals and spring break, the Beavers will stage nine practices over a three-week period, with the spring game set for April 20. "Our guys can't wait to get back to work," Smith says. "We're looking forward to all aspects. Everything feels better in Year Two."